I recently converted a Ruger Single-Six into a trail gun (refer to my article Building the Ulitimate .22 Trail Gun). In the process of dry-firing the gun the firing pin broke. Because the firing pin on a Single-Six is blocked from protruding too far it won’t peen the tops of the chambers, so I thought there wouldn’t be any problem dry firing. I purchased this gun in 2003 and it was very rough compared to a Single-Six I purchased in 1977, so I suspect this gun was built during a time of high volume production and low quality, so it didn’t surprise me that the firing pin broke! 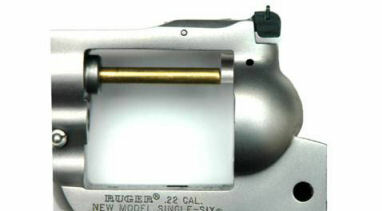 The firing pin sits in a bushing (Ruger calls this a recoil shield) that is held in place by a cross pin. The cross pin is not installed horizontally; it is installed at an angle. There is a hole in the loading gate notch in the frame; this is one end of the cross pin. The other end of the pin is blended with the frame so it is difficult to see. First I took a prick punch and marked the position of the recoil shield in the cylinder frame. This was so I could get the recoil shield rotated correctly when replacing it in the frame. Then I took a punch and drove out the cross pin from the hole in the loading gate notch through the frame. I completely disassembled the gun and tried to drive the recoil shield out of the cylinder frame by applying a punch to the rear of the broken firing pin, but all I succeeding in doing was peening the frame so the firing pin wouldn’t move anymore. I poured some Kroil oil into the firing pin hole to loosen up the recoil shield and waited a couple of hours. After soaking I used a heavy ball-peen hammer to strike the punch and the recoil shield came right out. After I removed the recoil shield I took a proper size drill bit and reamed the firing pin hole in the frame. This removed any burrs left by the punch. I ordered two spare firing pins from Brownells #780-001-132 just in case I broke another one. When the parts arrived I reassembled the firing pin, rebound spring, and recoil shield and started them into the hole in the frame. I lined up the two marks I made with the prick punch and inserted a brass rod through the bore so it touched the front of the recoil shield. Because this was a .22 the recoil shield was not directly in line with the bore so my brass rod only touched the bottom of the recoil shield as shown in the above photo. 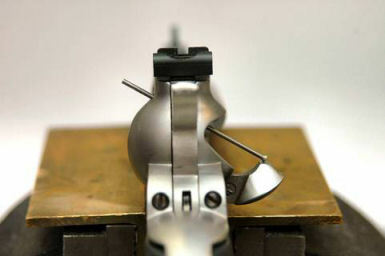 Tapping on the brass rod caused the recoil shield to become tilted. I took a brass punch and also tapped on either side of the recoil shield to ensure it was being seated straight. I continued tapping the bottom and sides until the recoil shield was back into position, then inserted the cross pin into the hole in the loading gate notch. Even though the cross pin was originally flush with the frame, I left it sunk a bit below the surface. I applied a drop of oil to the front and rear of the firing pin to ensure the parts were sufficiently lubricated. I took a 400-grit polishing stone and polished the front of the recoil shield and frame to ensure these surfaces were flush and smooth. This was to ensure the cylinder would rotate freely with no binding. Now my trail gun is back in service, but I probably won’t be dry-firing it very much! 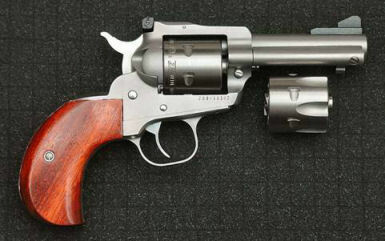 By the way, this is the same process for pretty much any Ruger single-action revolver.